This is even beyond my imagination. How is it possible in our day and age, because we have developed cultures of death. What really makes the UK and the US any different than Nazi Germany, except that our enemy is now unborn children, who threaten our way of life. This an atrocity of huge proportion that will be simply swept under the rug. 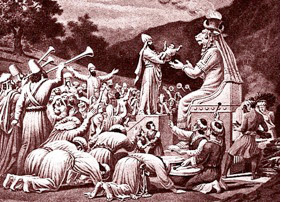 As a god worshipped by the Phoenicians and Canaanites, Moloch had associations with a particular kind of propitiatory child sacrifice by parents. Moloch figures in the Book of Deuteronomy and in the Book of Leviticus as a form of idolatry (Leviticus 18:21: ‘And thou shalt not let any of thy seed pass through the fire to Moloch’). In the Old Testament, Gehenna was a valley by Jerusalem, where apostate Israelites and followers of various Baalim and Caananite gods, including Moloch, sacrificed their children by fire (2 Chr. 28:3, 33:6; Jer. 7:31, 19:2–6). At least 15,500 foetal remains were incinerated by 27 NHS trusts over the last two years alone. . . The programme [about this atrocity], which will air tonight [in Great Britain], found that parents who lose children in early pregnancy were often treated without compassion and were not consulted about what they wanted to happen to the remains. Why is it totally unacceptable? Why was it OK to extract the non-human tissue from the women and discard it as nothing more than a diseased appendix but not acceptable to use them as fuel?